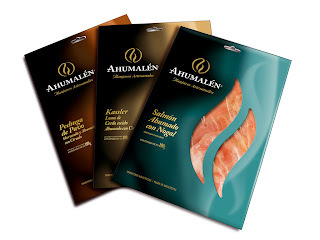 "Sabores y Placeres is a new Argentine super premium smoked food producer specialized in a wide variety of Patagonian exclusive fish and meat including salmon, trout, pork, turkey, duck, deer, wild boar, among others, commercialized under its main brand, Ahumalén. New premium brands, more often than not, need to establish themselves with limited budgets in markets dominated by existing brands. It follows that if they have to meet with any success they need to be highly differentiated. 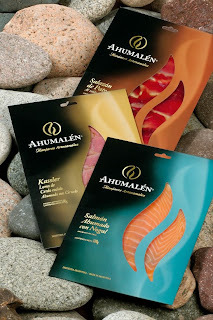 The challenge consisted on conveying Ahumalén’s primary equities as an exquisite, traditionally crafted, smoked delicatessen from Argentina through a new brand image and product packaging, in order to find a place in the upper range of the premium international market. As the category was flooded with crafty, homemade-looking products, Tridimage decided to try a more refined approach in order to stand out. Black, gold foil, metallic ink, and a different color coding each variety compose the spine of the resulting design, aiming for an elegant yet tempting subtle feeling. In order to capitalize the product’s quality a window exposes the content, boosting both visual impact and seduction. Quality is Sabores y Placeres leitmotiv throughout their entire production process, from raw materials to packaging design and communication. 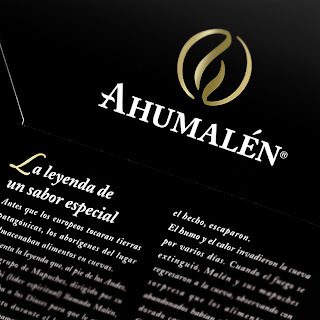 The results of that effort have been rapidly noticeable, as Ahumalén is currently making strong inroads in both local and foreign markets."